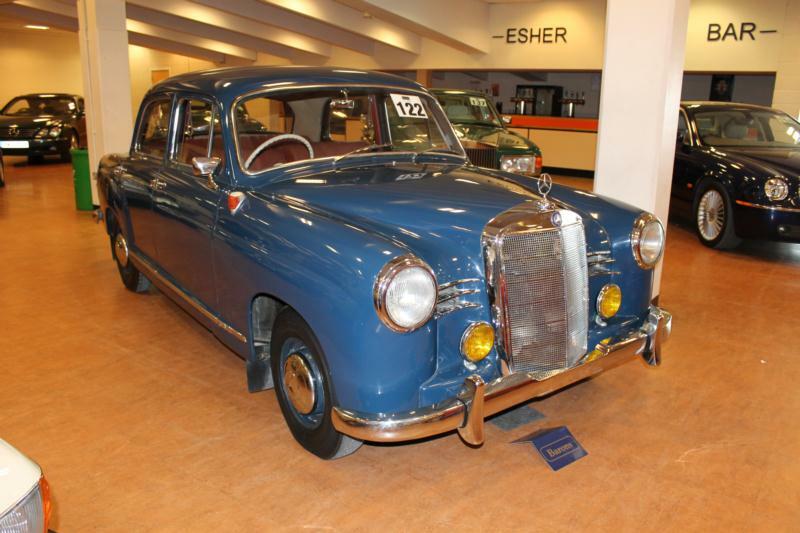 The Mercedes-Benz 180 was launched in 1953 as the company’s first sophisticated unibody design. Nicknamed “Ponton” because of its rounded shape and known internally as the W120, the series lasted until 1962. It was a huge advance over the prewar body-on-frame 170 models, though it still used the 52 bhp four-cylinder side-valve engine of the 170 S. With a full-width body, it offered 22 percent more interior space and boasted 40 percent larger glass area. A traditional radiator shell was fitted and was raised along with the one-piece hood. A separate front sub-frame was mounted on three rubber blocks, and carried the engine, gearbox and coil spring independent front suspension. Another structure located the swing-axle rear suspension and both were detachable as units. A single pivot swing axle replaced the old double pivot axle in September 1955. The real gain in the new model was in the exceptional rigidity of the unibody, with the floors welded to immensely strong side members. The new 180 was lighter, stronger and quieter than the 170 S, with top speed of 78 mph and superior road holding. Production ran from July 1953 to June 1957 and totaled 52,186 units, with peak year being 1954 when 20,306 were sold. The factory built only four-door sedans throughout the model run, though coachbuilders offered station wagons and ambulances. The 180a was launched in September 1957 and 27,353 were built by July 1959. It was fitted with the 65-bhp, OHC 1,897cc four-cylinder engine. Servo-assisted brakes were optional and top speed rose to 84 mph. The 180b was built from July 1959 to August 1961 and came with larger brakes and a wider radiator shell, and 29,415 examples found buyers. The final 180d model was built until October 1962 with improved valve gear. A total of 9,280 were sold. Diesel 180s were commonly used as taxis in Germany and sales far outnumbered gasoline models, while body and mechanical improvements were shared. The 180D was built from October 1953 to July 1959 and 116,485 were sold. The 180Db followed from July 1959 to August 1961, with 24,676 buyers, while the 180Dc finished the line in October 1962 with 11,822 units. The 180D and Db side-valve engines displaced 1,767 cc and produced from 40-43 bhp, while the 180Dc received an OHC 1,988 unit good for 48 bhp. As Germany prospered in the 1950s, Mercedes-Benz offered more cars for the burgeoning middle class. The 190, internally known as the W121, was introduced at the 1956 Frankfurt Show. It was an up-market version of the 180 with a new 75-bhp OHC four-cylinder engine of 1,897cc that was detuned from the 190SL roadster, but still good for 86 mph. There were now four mounting points for the front sub-frame, which made the car smoother and quieter. Interior appointments were nicer but only the chrome strip along the rocker panel distinguished it from the 180 on the outside. A total of 61,345 were sold between March 1956 and August 1959. The 190b was introduced in June 1959, with a wider radiator shell and 28,463 found buyers. The 190c appeared in August 1961 and replaced the old 1953 body with the new “fintail” but with a shorter nose and single headlights. It was longer, larger and lower and it looked modern. By 1965 at total of 130,554 had been sold. The 190D was also the mainstay of taxi companies and proved equally durable. The 190D was launched in August 1958 with a 1,897cc 50 bhp OHC engine, and Karl Kling won the tough Algiers-Capetown African Rally, averaging 55.5 mph. From 1958-59 a total of 20,629 diesels were sold, followed by 61,309 examples of the modified 190b by 1961. The new fintail 190c was introduced in 1961 and 225,645 would find buyers before the model was replaced by the 200D in 1965. Neither 180 or 190 models are particularly collectible, but their owners are fiercely loyal, thanks to their near indestructibility. Rust can be a problem, but mechanical parts are readily available for the most part. Many cars outlast their owners.